The massive and ongoing modernisation plan of the Indian Air Force (IAF) will entail induction of more and sophisticated fighter planes over the next few years, till the IAF reaches its sanctioned strength of 42 fighter squadrons. 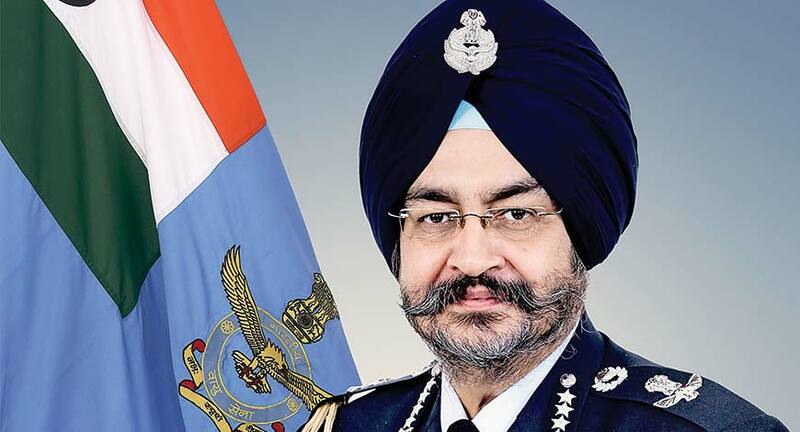 In a free-wheeling chat with Manish Kumar Jha , Air Chief Marshal B. S. Dhanoa talks of the firepower of the IAF. We see emergence of warfare that is unconventional, erratic and full of hurdles. What will warfare be like in the future? The IAF is equipped to face challenges that emanate across the entire spectrum. Modern warfare is essentially a metamorphosis of hybrid warfare. Nations go to war to further policy. Even though it can be practised in a conventional and sub-conventional manner, war is eventually a tool to enforce political will. What is the role of the IAF in such a scenario? The IAF is an ardent student of modern warfare and has geared itself up both in terms of training as well as equipment across the entire spectrum. Is the IAF in a state of preparedness even for a situation of war on two fronts? The IAF is ready to take on any adversary with the available resources. You visited Australia last year to promote defence ties. Do you see any progress on the Quadrilateral Security Dialogue or QUAD? The IAF and the Australian Air Force have set course on a new journey with Exercise Pitch Black. Our experience in Exercise Pitch Black has been extremely heartening and has given our pilots good exposure to the norms and methods practised in aerial warfare by Australia and its allies. Australia is our neighbour in the Indian Ocean and we share mutual concerns on net security within the Indian Ocean region. We are in the process of exploring areas of mutual interest in order to strengthen bilateral relations between the Air Forces in a cogent and comprehensive manner. How do you assess the strength of the IAF fleet, which has fighter planes that range from extremely old fighter aircraft on their way to retirement like the MiG 21 to cutting edge and expensive multi-role aircraft like the Su-30 MKI, Tejas and shortly, Rafale? The IAF has been operating a varied inventory of aircraft from the very beginning. The legacy fighter aircraft are gradually being phased out on completion of their Total Technical Life. The IAF had invested in developing a digital material management system and the Air Force is proud that for over a decade we have had a robust Integrated Material Management Online System (IMMOLS) in place. The modern combat platforms have similar material management systems. Furthermore, for new acquisitions, the IAF has invested in performance-based logistics to achieve a high availability of these combat platforms. Training of our air warriors cater to branch and trade-related and platform/system specific training. As older systems with the IAF have been upgraded and evolved, the training encompasses knowledge of legacy as well as present day state-of-the-art technologies. Training patterns are constantly evolving to imbibe cutting edge developments and the training curriculum is designed and structured to be inherently capable of incorporating diversity of platforms and systems. As a first rate fighter pilot, what would you prioritise in judging the capability of fighter aircraft? The ability to carry out the assigned task in a contemporary environment. The IAF has begun the process of acquiring 114 new fighter aircraft. Could you share the broad contours of the technology we need to maintain our capability and superiority in the sky? Airpower is technology intensive, wherein the combat potential, superiority and survivability of a fighter aircraft are defined by a multitude of onboard sensors and weapon systems. The 114 fighters will be acquired through the Strategic Partnership route and the process laid down in Chapter VII of DPP-16 will be followed. The responses to the request for information (RFI) have been received and are being examined. The Air Staff Qualitative Requirements for the current proposal will be defined to maximise competition, so as to ensure technology gain in support of our Make in India objective. Transfer of key technologies would be the integral part of this procurement. The IAF is about high technology and training. Could you share these elements of the modernisation plan? (a) Flying training has evolved with the procurement of the Pilatus PC-7 Mk II trainer ac, associated simulators and debrief aids for basic training (Stage I). While we continue to use the Kiran Mk-I and IA for the next stage of training, pilots selected for the fighter stream move onto the Hawk AJT for Stage-III training. Both PC-7 and Hawk ac are modern and the current generation aircraft have Full Mission simulators and debrief devices to improve the pace of learning and provide realistic training under all envisaged environmental conditions through varied simulations. In view of the end of the useable flight life of the Kiran in the near future, the IAF has already carried out a successful pilot project on Stage II training on the PC-7 ac, changing from its present three-aircraft to a two-aircraft training pattern. (b) Ground training for officers and airmen has also been continuously enhanced and modernised with the induction of simulators like driving simulators and simulators for systems and equipment. We have moved from textbook-based curriculum to providing trainees with tablet devices to increase the quantum of information accorded to the trainee in easily understandable form, with easy dissemination. This method also simplifies tests and examinations and provides an interactive mechanism for addressing queries, allowing improved education.